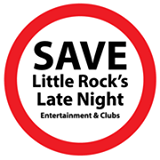 There is a very real danger that Little Rock clubs will lose between 60% and 75% of their business and potentially be forced to shut down altogether if this measure to close all bars and clubs by 2am is passed. A study of the economic impact indicates that even if they are able to maintain a portion of their business, they will potentially be looking at laying off roughly 153 individuals representing over $1.3 million in salaries. Many of these 150 plus individuals all have families, children, living and healthcare expenses.